Toyama Bay is the habitat of the world-famous glowing firefly squid, which surface in large numbers every spring in a phenomenon that has been designated a special natural monument. Peak firefly squid season means big catches for fishermen and brisk business for sightseeing boats that provide close-up views of the magical action. Early in the morning, after 3 AM, sightseeing boats depart the Namerikawa fishing port (Namerikawa is also home to the world's only museum dedicated to the firefly squid) in Toyama prefecture, making a short journey to fixed nets located about 1 to 2 km offshore. 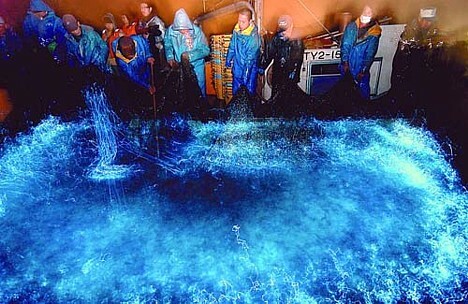 As the fishermen haul in their nets, the light emitted by the firefly squid causes the sea surface to glow a cobalt blue, evoking squeals of delight from the tourists. 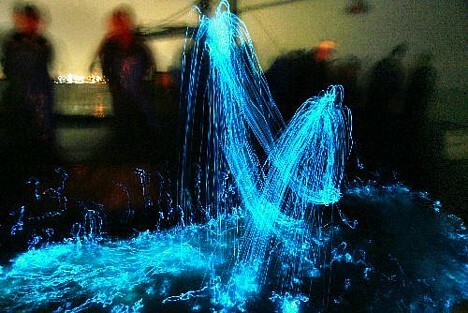 Toyama Bay's firefly squid fishing season opened on March 1 and is expected to continue until the end of June. Sightseeing boats are scheduled to run until May 7. This reminds me of my childhoold days in Brazil, fishing my father and friends. One night, around 3am, in a pier, I went down to the water to wash my hands and quickly removed the hand from the water when I noticed a strong blue/greenish glow. I then "disturbed" the water with a stick and the water brightened again for a few seconds. I was told those are algae or something similar, which emit light once you "touch" then. The effect is striking and beautiful. I've seen this in Shimizu, Shizuoka in Japan! I had no idea what it was at the time, but it was the most amazing thing I have ever seen. It is unreal how the entire ocean seemed to glow with every wave. I wish everyone could see this in person. I worked at a summer camp on an island outside of Seattle. One summer night after a bright, sunny day, the clouds rolled in and rain fell hard from the sky. Down on the piers, each raindrop that hit the water made a lighted ringlet ripple - one of the most beautiful things I've ever seen! Stop the insanity !!!! Save the Firefly shrimp. Oh the cruelty. I was thinking about you talking about how fireflies get their light. This is for my science project. I wounder how fireflies get their light. Can you please explain to me , i really need to. This is really important. Can you e-mail me. Thanks. P.S. I'm only eight going up to nine! P.S.S. I'm in third grade now and i think this how fireflies get their light thing is just right for me. I would like to see the firefly squids, but not the fishermen killing them all. I've seen dozens of pictures of Japanese fishermen slaughtering dolphins in bay in Japan - it's enough! Mayhem-Ville » Blog Archive » Firefly Squids - Damn cool PC lighting mod?